On the first day of filming ‘Swallows & Amazons’ in May 1973, a huge effort was made to ‘dress’ Haverthwaite Railway Station, at the southern end of Windermere. The aim was to bring across the feel of a bustling 1929 holiday destination. Local people had been previously fitted with costumes in the Ambleside Church Hall, there was a horse and cart, porters’ trolleys laden with trunks and a number of old bikes, which were all of great interest to us. Having stepped down from the steam locomotive, where the Times photographer must have taken this shot, we were piled into an open-topped period vehicle, for further publicity photographs. I liked sitting on the car but thought the photograph was silly, especially since Kit Seymour and Lesley Bennett, who played the Amazons, were wearing ordinary clothes rather than period costumes. The result was later published in both The Guardian and Woman’s Realm. Virginia McKenna was interviewed by journalists while we were hurried away to get on with our lessons. Our tutor taught us Art. I drew the a picture of the motor car. The yellow motor used in the film for our taxi was superb. I can only imagine it was far grander than a real Lakeland taxi would have been. Sten, playing Roger, hung out of the window as the director, Claude Whatham, ‘filmed us driving out of the station, along the platform at top speed,’ as I recorded in my diary. Arriving at Holly Howe in the yellow taxi was truly exciting. It was not filmed the next day, as I think rain had set in. Claude waited for good evening light. 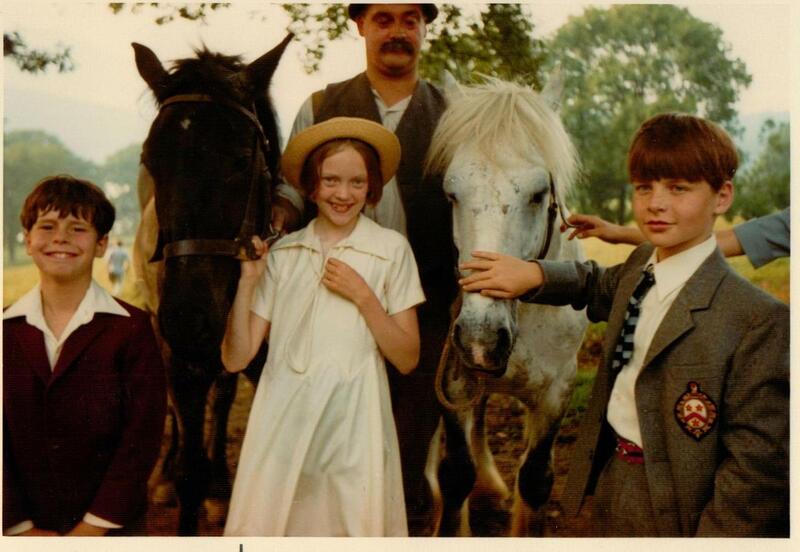 But I remember the thrill of drawing up outside the farmhouse in the old car and pulling on my hat as we spilled out and ran past the big farm horses Mr Jackson was leading into the yard. I’m afraid our OOV (out of vision) dialogue was added later. If you ever go to Bank Ground Farm near Coniston, called Holly Howe by Arthur Ransome in his books, you must run down the field to the lake as we did. As soon as you arrive. And at top speed. And you will be filled by the same feeling of elation as we were when we played the Walker children. The slope, formed by glacial scouring and subsequent deposits long ago, is steeper than you think. You soon learn the art of glaumphing at which I became adept as a child. What struck me when I returned to Bank Ground Farm one Spring, was that sadly the great trees have gone from around the old farm gate and the boatsheds down by the lake. They must simply have reached the end of their lives. However Richard and Claude chose Friar’s Crag on Derwent Water for the location. I didn’t know it but Christina Hardyment writes in her excellent book, Arthur Ransome and Captain Flint’s Trunk that they had found the very place Ransome had in mind, “without the slightest idea that they were quite right to be doing so.” She found that Ransome had marked up postcard of Friar’s Peak for his illustrator Clifford Webb to work from in 1930. It feels completely right when you are there, with the iconic view of an island under the towering mountains. It was over a shot of this that they added the opening titles. Sout Cortez, however, was not there. Neither were we children. By the time we had been transported from Coniston to Derwent Water for this scheduled scene the sun was going down. We’d been delayed by the make-up artist who was determined to tone down the tans we had developed. This took ages. He used a very small sponge. My mother was frustrated as she thought that this would never have shown up, but he put his foot down with the result that we were ‘late on set’ for the evening shots. Claude Whatham was very cross about it. One of the big secrets of the film is that the sequence when we run up to the Peak at Darien and first set eyes on the island in the lake was shot under an oak tree in Runnymede, near the River Thames. We were not an island at all. It must have been an expensive ‘pick-up shot’, but we enjoyed meeting up again immensely. Claude had made an effort to gather together the same crew members and I was back in my lovely silk dress once more. We knew how to act by then and the joy of being together again shows on our faces. The result was a scene to set the film off on the right foot. We were jubilant and so excited, that, like swallows, we could have taken flight. I would have to check with Richard Pilbrow to be certain but I think that Simon Holland, the Art Director, penned the SWALLOWS and AMAZONS graphics for the opening titles. I remember a discussion about the font type. A very fashionable script used on the poster of the film was favoured. I said that I thought they ought to use the handwritten capitals that Clifford Webb had penned on the map in the opening cover of the book and copied by Simon Holland (and me) on our chart. This was chosen. The Seventies’ font, above, had been used for the titles of Lionel Jefferey’s movie The Railway Children, which starred Jenny Agutter. As a viewer I felt that this soon dated it, whilst Swallows and Amazons sailed onto our television screens in the 1980’s and 1990’s, indeed into the 21st century, without being spoilt by what became most unfashionable graphics. Of course now that particular retro font is all the rage. For sometime a DVD has been available which gives you both films. You can read more in ‘The Making of Swallows and Amazons’ published by the Lutterworth Press, available online and at all good bookshops. Have you any questions about the film or the BBC serial of Coot Club? My book ‘Funnily Enough’ is just out. 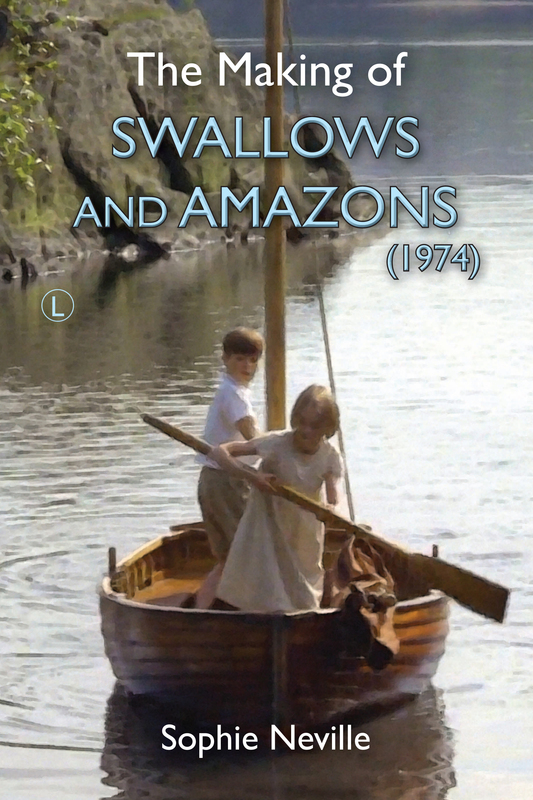 It includes a section on Swallows and Amazons. Please see the links to the right of the postings for details.